October 25th was marked by GEM's first international 30th anniversary event. The celebration was a huge success with over 250 alumni in attendance. Continue reading for more information about this great event and the volunteers and staff who were crucial to its success. 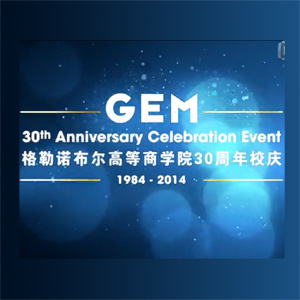 On October 25th, 2014 GEM Alumni Relations hosted its first major international event to celebrate GEM’s 30th anniversary at the Shanghai Yacht Club in China. It is the largest International Alumni event to date, with over 250 alumni from the GGSB, ESC and Doctoral School as well as 22 VIPs in attendance. Our Dean and Director Loick Roche gave an inspiring speech about the history of GEM in China and the multiple ties forged by 50 years of Sino-French economic agreements. The GEM Alumni Relations Director Hazel Jourdin announced the launch of the GEM China Alumni Club, which was another first for GEM under its new international framework. The press coverage was exceptional – we were the Editor's Pick and top story of the Shanghai Daily metro news section and were also featured during Hong Kong TV’s midday news! Alumni Relations would like to thank all our alumni for attending. We were happy to see so many of you and proud to learn about your developments since graduation. We would also like to extend a special thank you to all the volunteers and staff for their commitment and energy. In particular, we thank Chao-Qun Pan, whose skills from his Master in Marketing were really put to the test, and of course our China Office Manager Amy Xu for making this event a huge success.